In North Dakota we do not normally get a lot of rainfall. Bismarck averages 16.8 inches of a precipitation a year, much of that is snow. This year we already have had more than that, and we still have 4 1/2 months to go. Our back yard seems to always be under water. Just this past Friday we had almost an inch and a half in just about 30 minutes. We have had cool mornings and dew. 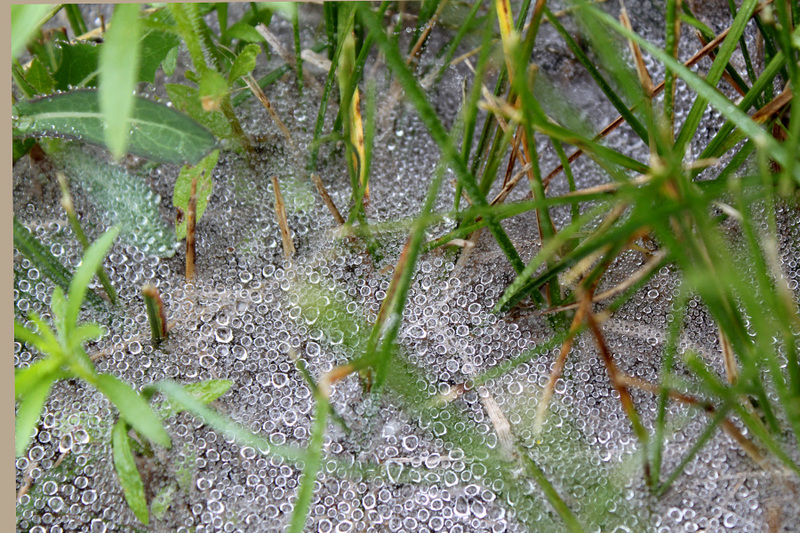 The other day I saw this wonderful spider web in the grass. Just love how the dew is so prominent. Nature’s beauty is stunning. Send some our way. Haven’t seen rain in a long time. 37 straight days over 100 and counting. 46 total. 2nd hottest summer on record. Yikes, that is awful. Our backyard is dying in places because it is sitting in water. Not sure but probably closest to the rainest season ever here. I think we hit 100 once and 90 a few times and when we did it was so humid. Suppose to be in the 70’s all week. I will think cool thoughts for you.